School student Henry McFarland has become the Mary Seacole Trust’s first young ambassador after winning a competition in which he wrote about the inspirational qualities of his twin brother, Hector, who has epilepsy. 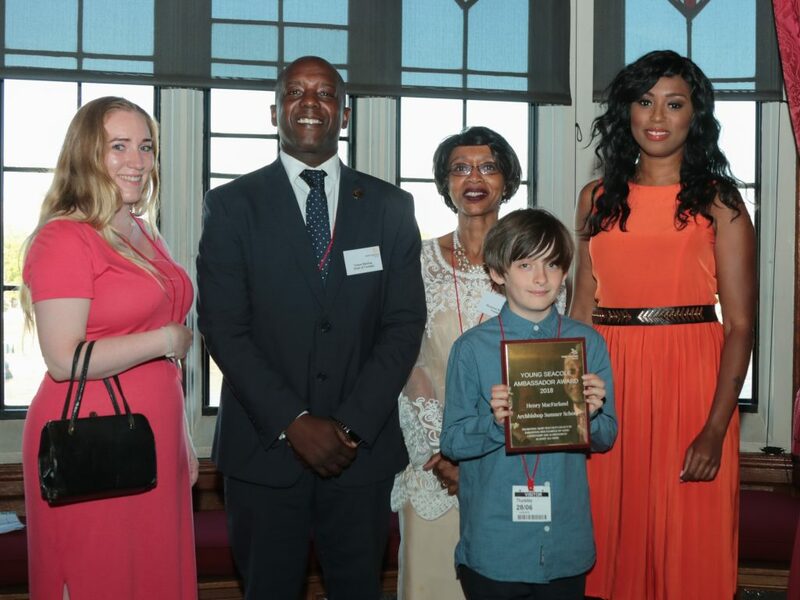 Henry was presented with the prize by multi-award winning TV and radio presenter Leah Charles King at a House of Lords ceremony. ‘I have chosen my brother because even though he has epilepsy he will always carry, I think that he represents the same qualities as Mary Seacole. He is always honest and speaks the truth even when he did something wrong. Even though he is held down by the world he still keeps carrying on, even when he has just come out of the hospital he will still be smiling and carries on. ‘He is always busy and helpful. When our co-op gets together to clean the communal garden he is always helping and is usually the last one out. He loves to play football with me he is really good at it. ‘My brother has had a lot of bad things happen to him but he doesn’t let that stop him. I know my brother is original because doesn’t let that stop him. I know there is a lot of potential in him. Henry was one of 75 children who entered the competition. They were asked to create a piece of work representing someone in their own life who embodies Mary’s qualities of compassion, good citizenship and achievement. They did this through stories, poems and drawings. The competition was open primarily to schools in Lambeth and Southwark but is likely to be rolled out more widely next year. MST Chair Trevor Sterling commented: ‘Mary Seacole overcame many obstacles to reach her goals in terms of caring for the men fighting in the Crimea. These children identified a wide range of people who share Mary’s qualities, ranging from their mums, dads and brothers to Princess Diana, Martin Luther King and Michelle Obama. ‘It has been a privilege to work with schools in Lambeth and Southwark who have taken part in the competition. We could not have done this without them and I would like to thank them for their support and enthusiasm. It has been a great opportunity to show that today’s children are well versed in the need for compassion, integrity and diversity in public life. Three runners up in the competition were: Carlos Cuenca Ruiz, Anisha Ahmed and Chaka-Tau Sankofa. A fund of up to £500 will be made available to the successful candidates’ schools. As part of the entry process, schools were asked to explain how they would spend the money on a Mary Seacole initiative. Competition judges were: Eli Anderson, Director of StoryAID; Jessica Barnes of Headway; Ben Green, child practitioner, family support worker and fitness coach; and media professional Debbie Hoyte. Also at the House of Lords were representatives from MST’s support organisations: Moore Blatch, Photofile and Partners in Costs.